Most of my food shopping is planned, but sometimes I buy an ingredient on a whim because I haven’t used it in a while, without having a plan what to do with it. And so I had some cranberries sitting in my fridge, waiting for a purpose. The last time I had to throw them out because they had gone bad before I used them. Cranberries are not on my usual repertoire. 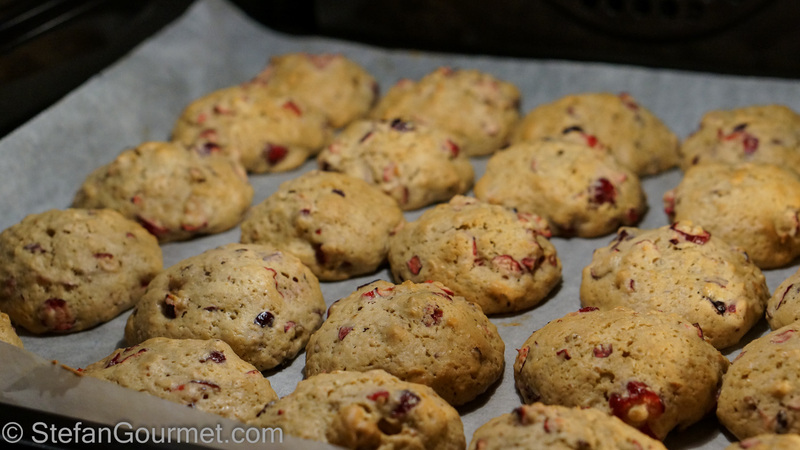 When I saw Mimi’s recipe for Cranberry Hazelnut cookies, I knew I had found the destiny of those cranberries as I also had some hazelnuts I needed to use up. I’m glad that I did, because they were great! 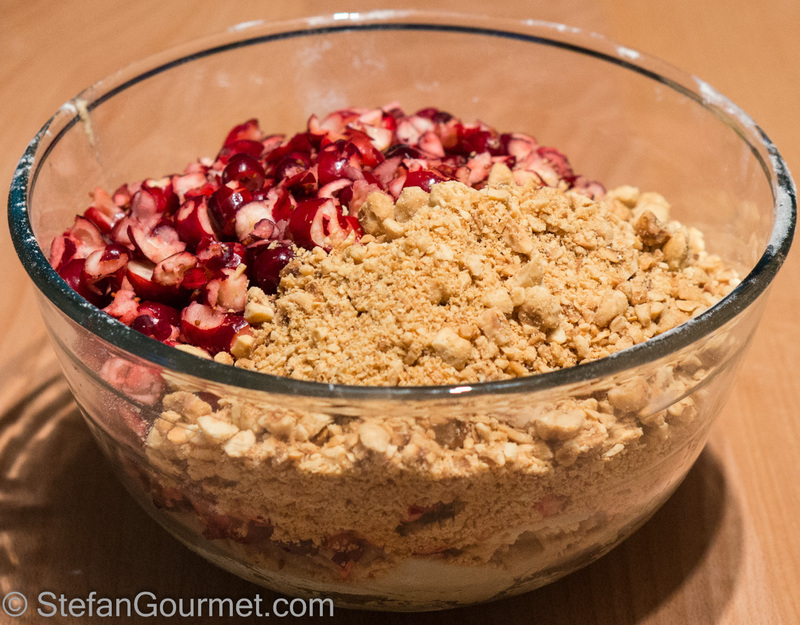 The combination of cranberries and hazelnuts works very well, and the cranberries give the cookies a very nice freshness. I also liked the soft tender texture of the cookies very much. I will definitely make them again. Thanks, Mimi! 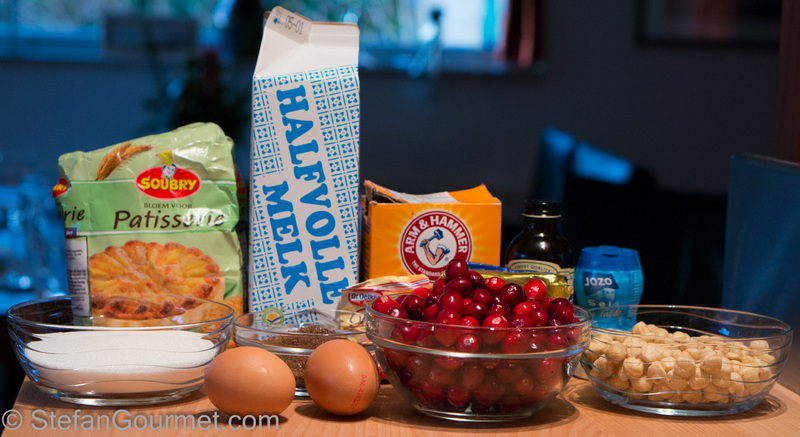 Unlike most other recipes, the amounts in recipes for baking need to be precise. A cup of flour, for instance, can be anywhere between 125 and 175 grams of flour, depending on the type of flour, whether it was sifted, how packed it is, etc. This becomes even more of an issue when you realise that “one cup cranberries, chopped” is not the same as “one cup chopped cranberries”. In the first case you measure a cup of cranberries and chop them, and in the second case you chop them first and then measure them. 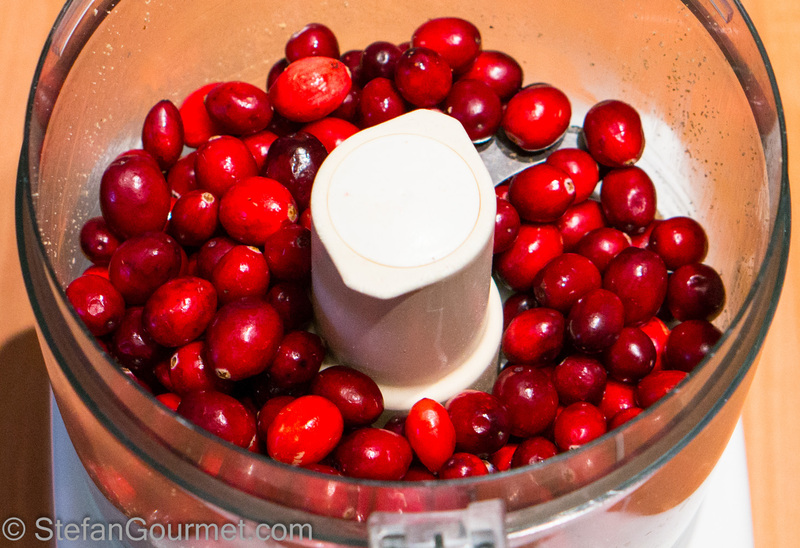 As the same weight of chopped cranberries takes up less space than whole cranberries, “one cup cranberries, chopped” is less cranberries than “one cup chopped cranberries”. 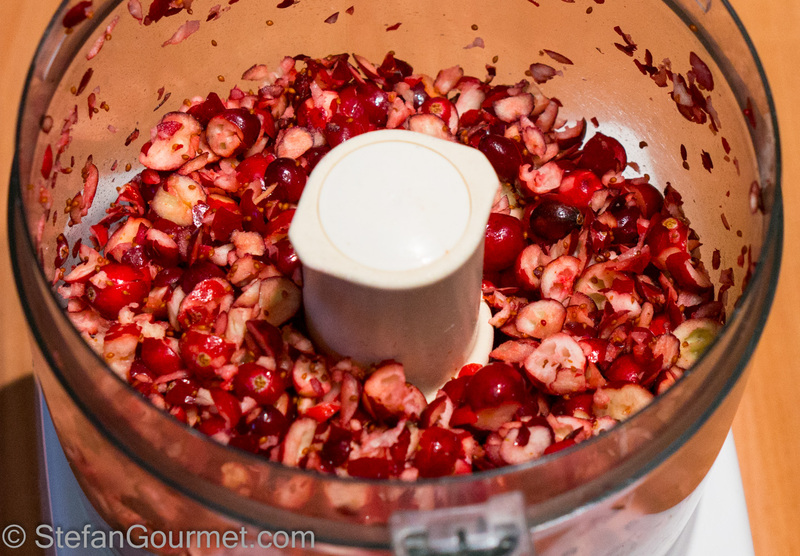 Even though I am well aware of this, I didn’t read Mimi’s recipe properly and only used 2 1/2 cups of cranberries and chopped them, rather than using 2 1/2 cups of chopped cranberries as specified by the recipe. The cookies were still great, but I did notice that they could have used a bit more cranberry. So next time I will use more. The amount of grams below has been adjusted to account for this. The above is why I prefer to use recipes in grams. I do provide amounts in tablespoons and cups in my recipes for those of you that do not have scales, but when in doubt use the amount in grams because on my blog that is always the more accurate number. The recipe makes about 36 cookies, which is more than will fit on a single baking sheet in my oven. You could make half the recipe, or use two sheets and rotate them after about 10 minutes. 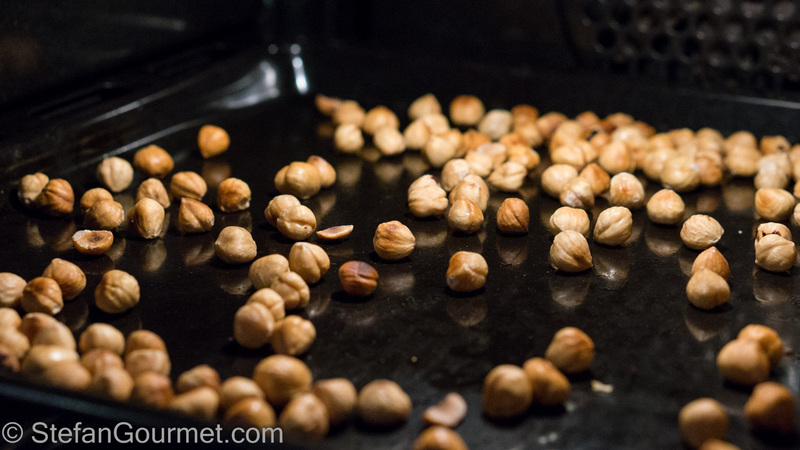 Toast the hazelnuts on a baking sheet for about 10 minutes at 180ºC/350ºF. 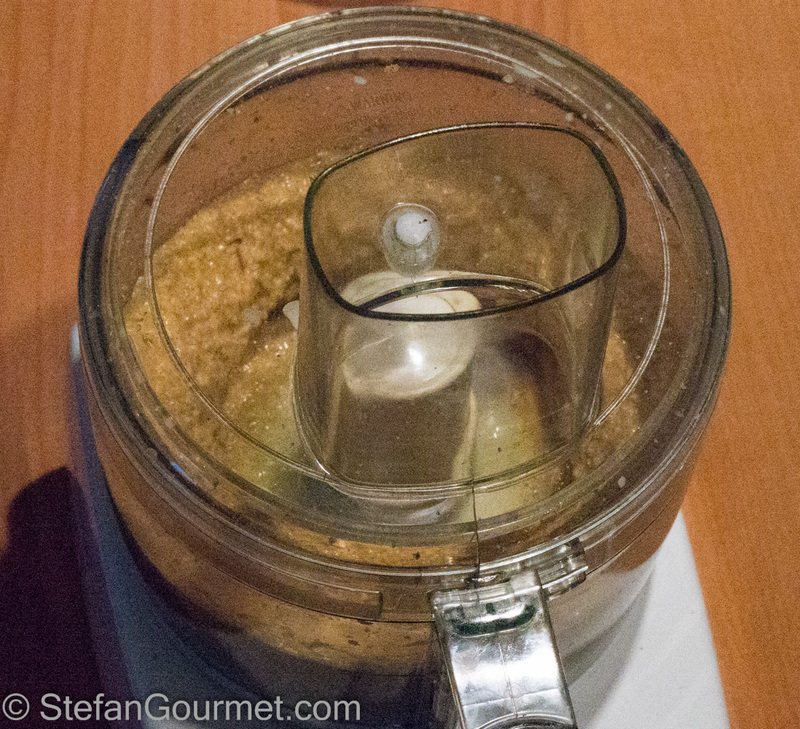 …and chop in a food processor using the “pulse” function. You are looking for chopped hazelnuts, not hazelnut meal. …and chop them as well. 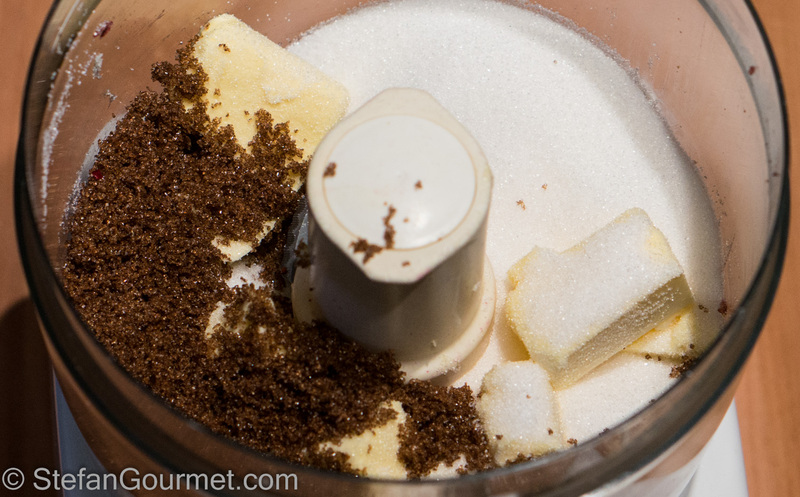 To make the dough, combine butter, white sugar, and brown sugar in the bowl of your food processor. …and the milk, as well as the vanilla. Process again until well mixed. …to obtain a dough that is not as crumbly as Mimi’s. 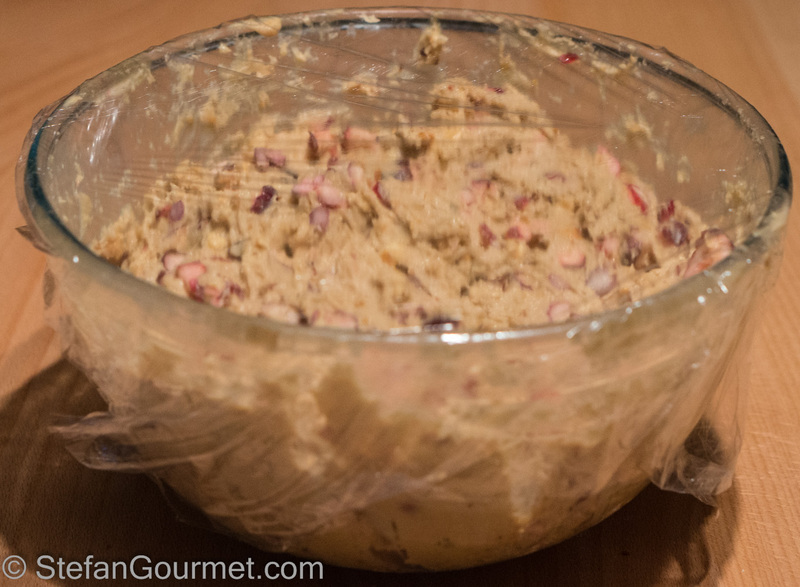 Cover the dough with plastic wrap and allow to rest in the refrigerator for a couple of hours or overnight. Preheat the oven to 190ºC/375ºF (fan forced). 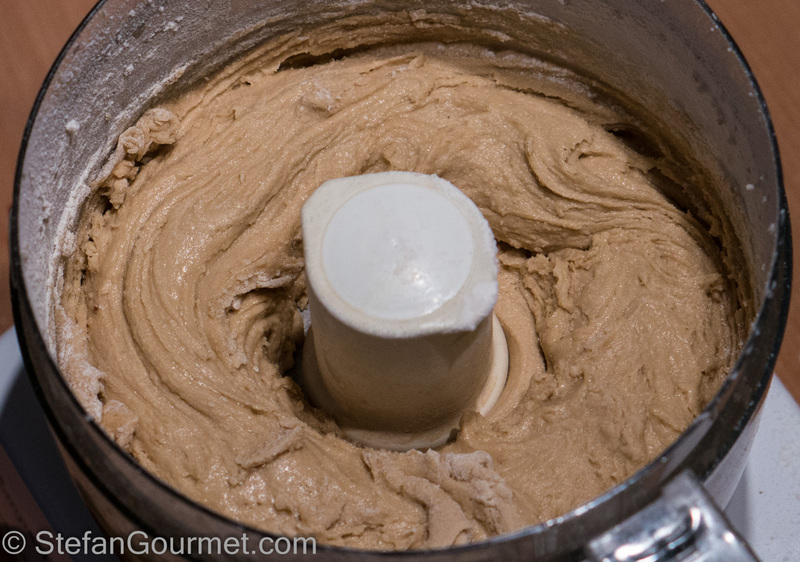 Take the dough out of the refrigerator half an hour before if it has been in the refrigerator for more than two hours. Arrange balls of dough on a cookie sheet lined with parchment paper. The balls should be about the size of ping pong balls. Leave plenty of space in between as they will expand during baking. Bake for 15 minutes at 190ºC/375ºF (fan forced) until slightly golden. They will still be soft to the touch. 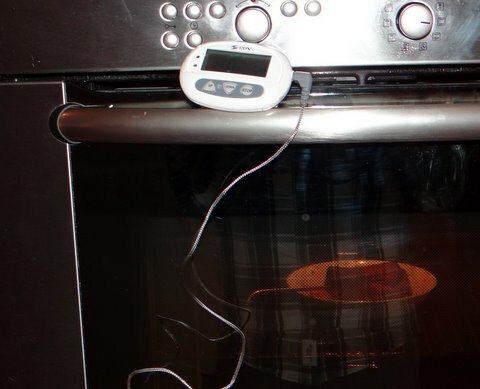 Two years ago I explained how to cook duck breast using a digital thermometer with a probe. I’m sorry about the misunderstanding about the cranberries. Perhaps I should have reiterated this in the directions. The cranberries, as you know, really add to the moistness of this cookie, and I love their flavor as well, so it’s nice to get the proper amount in there. But I wanted to point out 2 things, knowing that you have most likely baked hundreds more cookies in your short life than I have in my long one. 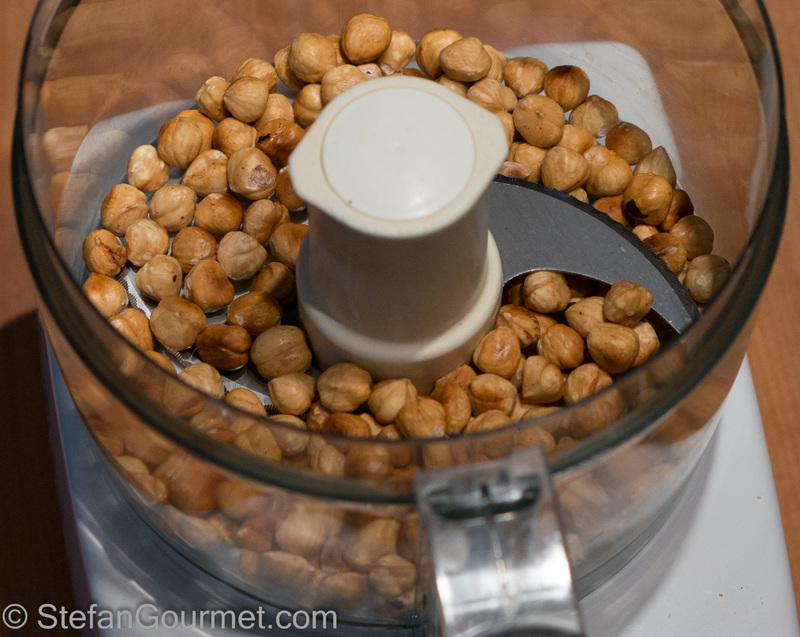 1.Typically, I chop nuts by hand, using a knife. Although this is tedious, you get to choose the larger pieces and avoid the nut “dust.” Nut dust, even the hazelnut “silt” (ex-geologist!) is essentially a dry ingredient to me. 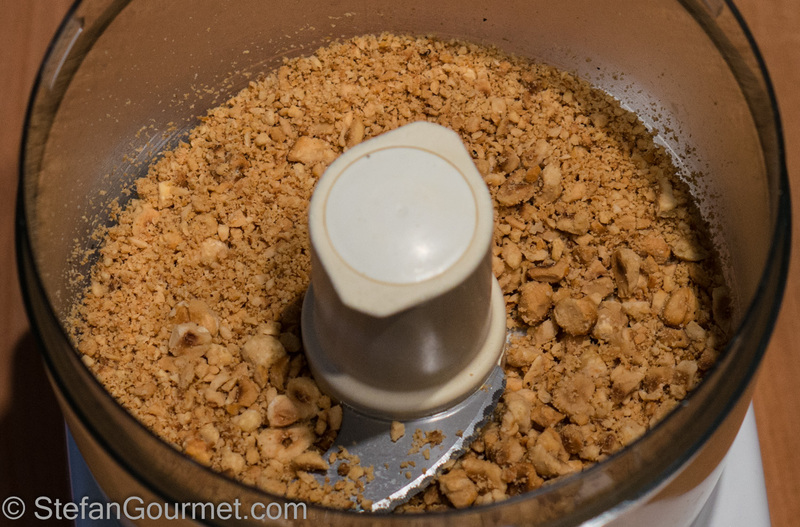 I have at times used a food processor to chop nuts, as I did in this recipe, but then I always sieve them in some way to remove the fine particles. 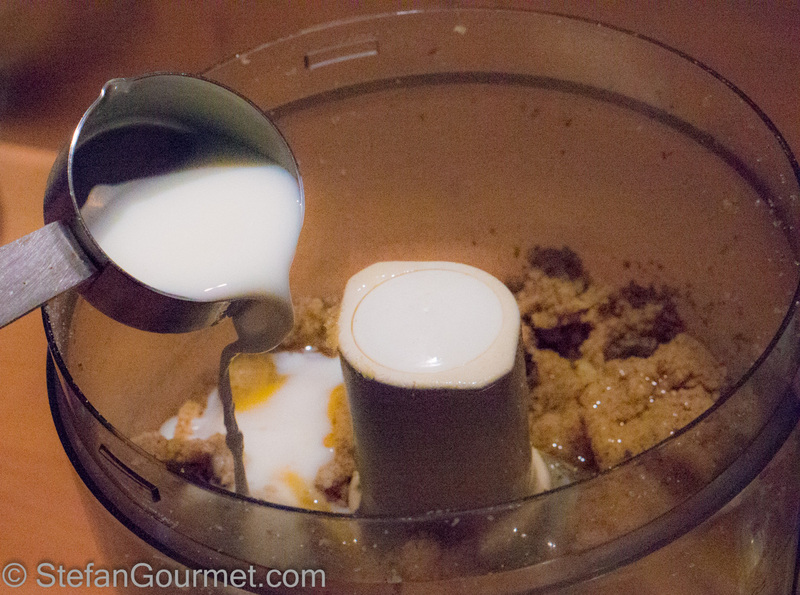 These will add to the volume of dry ingredients, and dry out the cookie. 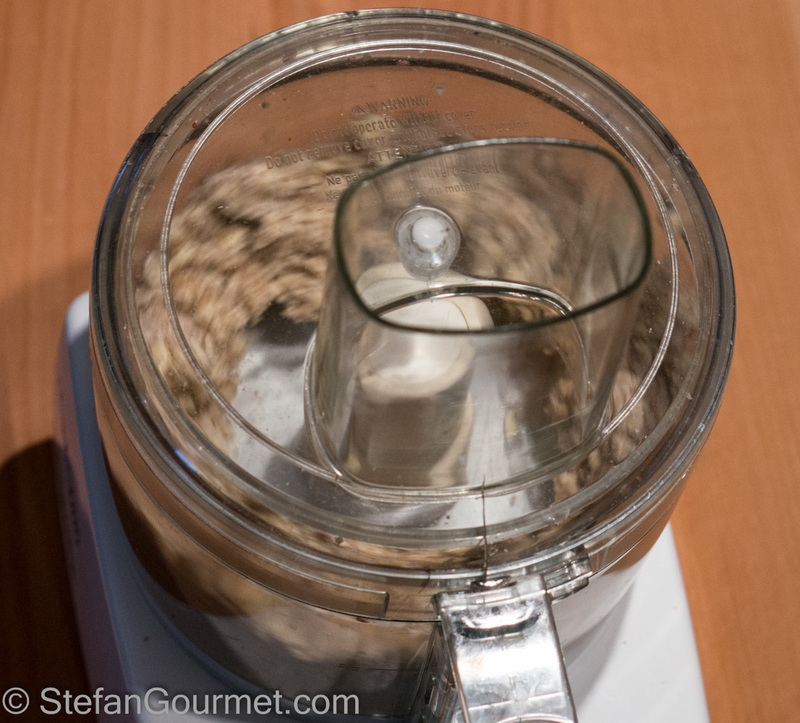 Sometimes I do it purposefully, like with a pancake batter, first stirring in finely chopped walnuts, for example, that include the finer particles. And then add the flour, etc. Now, I’m not saying this is a rule, and that you should do this as well, this is just what I personally do. Because basic baking, to me, is about the ratio of wet to dry ingredients. But your cookies did come out lovely, like I said. And I’m glad they didn’t turn out dry! 2. 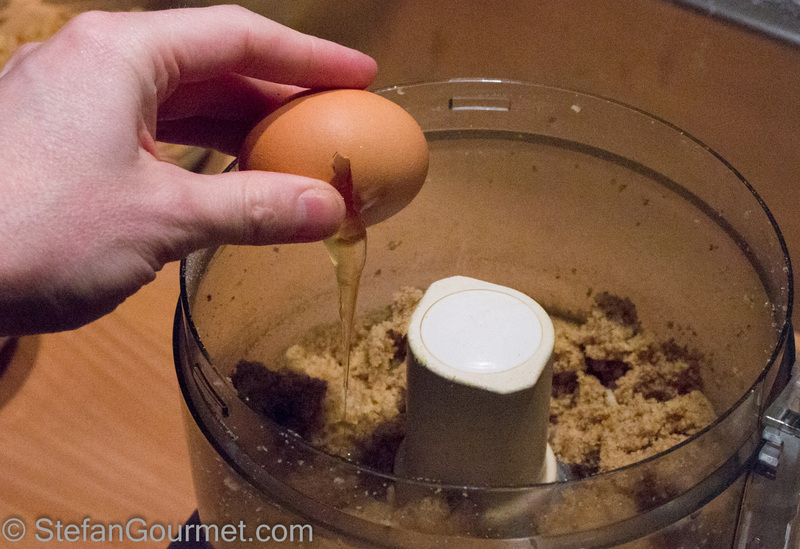 I have never ever seen anyone make a whole cookie batter in a food processor! 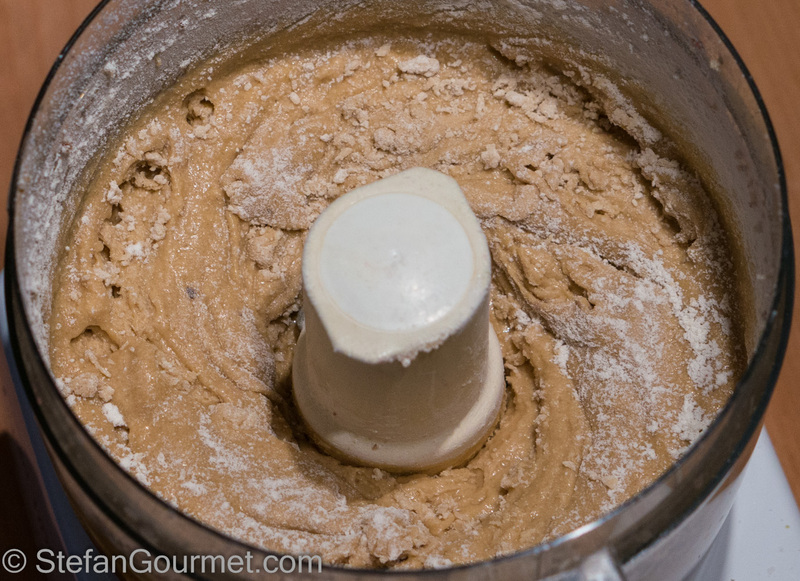 How you were able to use it and not overprocess the cookie dough astounds me! You must have the magic touch! Amazing! Saves on sore arms! Thank you for posting on this cookie. 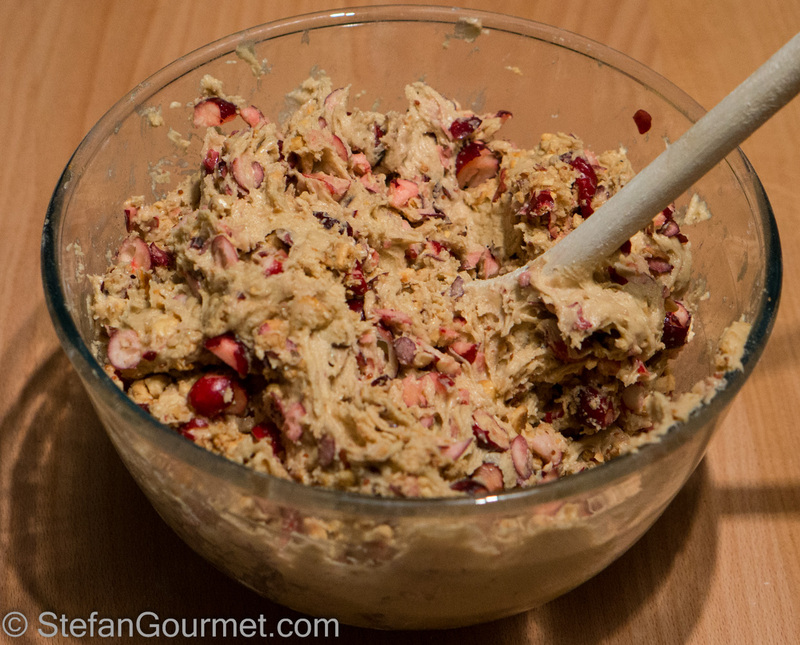 There really is something wonderful about the cranberry hazelnut combination! I also chop walnuts by hand, and even almonds, but hazelnuts? They are like little balls and would fly all over my kitchen! You are right that there was some “silt” that affected the dry-to-wet ratio, but I may have used less flour than you do as my dough still turned out wetter. I probably did over mix the dough, but this dough seemed very forgiving to me. I should have used the stand mixer instead. I actually liked this dough so much that I am going to use it as a base for a new almond-based cookie I want to develop 🙂 Even after a week (yes they lasted that long — you know how we feel about portion control) they were still moist and tender. So thanks again for posting the recipe! I know, I got carried away typing. Most of the time I’m on my ipad and my comments are very short! You must have used less flour, and that’s why the cookies look perfect; they had a nice rise to them. I figured you have a lot of knowledge because of all of your experience, plus common sense. I didn’t want to come across presumptious. I just saw that whole jar full of the processed hazelnuts and that set me back!!! Can’t wait for your own cookie! I wish I had inherited that portion control thing from both of my European-born parents. Sadly, I’m too American! I have more experience with cakes than with cookies, but most of it carries over. I bake lots of cookies, but almost always the same ones (almond-coconut-lemon). Great stuff Stefan (and Mimi). I love the new theme too. I have been himing and hawing about a change myself. I have been using my current theme for a couple of years and things are moving on. I should look some more, as I’d like to have bigger featured photos on the home/archives page. But it’s definitely an improvement. – Quality, marvelous cookies! kudos to Mimi and you, Stefan! – Your blog’s new look is fabulous! Just as it’s theme name is, fresh & clean. The blue tone all over works so well, and easy on the eyes. Thanks, Fae! After more than two years, I thought it was time for something new. Mimi, I enjoyed your essay, above! 🙂 Stefan, I am looking forward to your almond-flavored cookie, too. The cookies look delicious! Well-done… worth an extra trip to the market, for sure. I just did the first experiment with the almond-flavored cookie, and am not completely happy with the result as it is not as moist as the cranberry hazelnut cookies. Perhaps the cranberries keep slowly releasing moisture, thus keeping the cookies moist? I think you are completely correct. When I bake with any moist fruit or vegetable, they release a lot of moisture, and the recipe must be adjusted accordingly. Baking is such a science, and you seem to be quite keen. You are right that it is a science, and what makes it harder is that not all the parameters are known. For instance, flour is hardly a standardized product and the gluten/protein content make a huge difference. So true, Stefan. It is best to weigh flour. Still, protein content in flour varies GREATLY between USA brands!